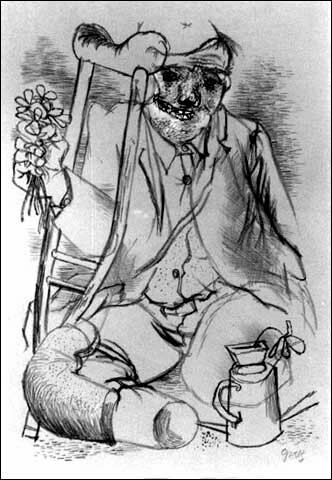 A mutilated and crippled war veteran, a step above begging, trying to sell wilted flowers to indifferent passerbys. Drawing by George Grosz, 1936. Grosz draws deliberately crude to amplify his distaste and disgust of German society of the time. His scathing criticism escapes no one. He attacks the society that casts off veterans and the poor as refuse, but there is also an implicit criticism of this hero as well. Was he duped into fighting for something that ultimately rejected him, or did he go willingly? Would this hero, given half a chance, fight for that society again? Sentenced to Death. George Grosz was born in Berlin in 1893. On the outbreak of the Great War he volunteered for the German Army. In 1915 he was released as unfit for duty. However, in 1917, desperate for soldiers, Grosz was conscripted again. After trying to commit suicide in 1917, Grosz was send to an army hospital. Then he was court-martialed for insubordination and sentenced to death. One of his patrons, Count Kessler, saved him from execution. He was now diagnosed as suffering from shell-shock and was discharged from the German Army. After the war Grosz became a famous expressionist painter (DaDa-movement). He was a leading anti-Nazi activist. In 1933, after being harassed by Hitler's Gestapo, Grosz fled to the USA. Click here to read more about this fascinating artist and war veteran.